This essay interrogates transhumanistic rhetoric’s technotopian teleological assumption and the profound political implications for its entelechy of human transformation. Burke’s interest in rhetorical form and his insistence on a complex interplay of rhetoric and dialectic are good reasons to examine transhumanism through Burke, and Burke through transhumanism. Additionally, combining Burke’s definition of man, his action/motion distinction, and the body as the place where action and motion meet yields insights on both transhumanist rhetoric and Burke. The human species can, if it wishes, transcend itself —not just sporadically, an individual here in one way, an individual there in another way, but in its entirety, as humanity. We need a name for this new belief. Perhaps transhumanism will serve. The human preoccupation with transcending our species’ physical limitations dates back to ancient history. Transhumanism is one of the most recent and successful discourses dedicated to the melding of technological experimentation and the extension of life for the human species. Transhumanism offers us a rhetorically imagined post natural history future. A robust technophilia and decentering of homo sapiens as a biological organism fuels the “trans-humanist fantasy of escape from the finite materiality of the enfleshed self” (Braidotti 91). Most accounts of the origins of transhumanism date to the early twentieth century with J. B. S. Haldane’s 1923 publication of the essay Daedalus: Science and the Future. However, what began as an obscure, fringe technotopian science-fiction discourse now boasts of contemporary advocates such as Peter Thiel who have been described in all seriousness as the “shadow president” of the United States (Kosoff 2017). Although transhumanist rhetoric evolved throughout the twentieth century with ideological inflections from several noteworthy thinkers, it has gained quite a lot of considerable ground since then. In 2015, Sam Frank wrote an extended report on transhumanism for Harper’s. Frank discovered the belief in transhumanism alive and well among a cadre he called the “apocalyptic libertarians of Silicon Valley” who are “mostly in their twenties: mathematicians, software engineers, quants, a scientist studying soot, employees of Google and Facebook, an eighteen-year-old Thiel Fellow who’d been paid $100,000 to leave Boston College and start a company, professional atheists, a Mormon turned atheist, an atheist turned Catholic, an Objectivist who was photographed at the premiere of Atlas Shrugged II: The Strike. There were about three men for every woman.” (4). Since the turn of the twenty-first century, this cadre has been busy founding well-funded scientific and political organizations such as the Center For Applied Rationality (CFAR), the Machine Intelligence Research Institute (MIRI), and conferences such as the Singularity Summit. They are well-educated, well-resourced, and true believers (Hart 1). Transhumanists take a machine metaphor and extend it to the digital age as a philosophically and scientifically tenable proposition: the body is hardware; the mind is software. Transhumanists eschew the essentialism of biological determinism and ecological holism, and instead choose to feature relationality as the starting point of an inherent and ontologically polysemous nature-culture continuum. This philosophical assumption could have positive political implications for typically devalued “others” in classical humanism such as nonhuman animals. However, one of transhumanism’s core beliefs is a technotopian telos for determining the best set of relationships and structures for humans and nature through technological intervention. The probable implications of this approach for non-human biological life forms, ecosystems within the biosphere, and the entire human species—are intentionally transformative. As an intellectual movement and social-political program, transhumanism has ethical consequences, implications for bodies and materiality, and transformations yielding altered agencies and responsibilities. Transhumanism imagines expanding the conventional boundaries of homo- sapiens through technological convergence. If this rhetoric were to become reality it would fundamentally alter ontology, epistemology, and axiology in the world as we know it. But what types of transformations are transhumanists trying to advance? And what are some of the implications to transhumanist assumptions and definitions of nature, technology, and man? This essay interrogates transhumanist rhetoric’s technotopian teleological assumption and the profound political implications for its entelechy of human transformation. 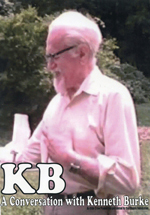 Kenneth Burke’s interest in rhetorical form and his insistence on a complex interplay of rhetoric and dialectic (Zappen5) are good reasons to examine transhumanism through Burke, and Burke through transhumanism. Additionally, Burke’s definition of man, his action/motion distinction, and focus on the body as the place where action and motion meet (Burke, Permanence 309), provide a splendid array of grammars that when combined yield insights on both transhumanist rhetoric and Burke. In order to do so, this essay is organized along the following lines. First, the essay explains and synthesizes the above-mentioned Burkean rhetorical principles. Second, the essay examines transhumanist rhetoric by critically examining the ideological influences of two of its key historical texts— The World, The Flesh, and The Devil (Bernal, 1929) and Transhumanism (Huxley 1953). Third, two cornerstones of contemporary transhumanist rhetoric—the Transhumanist logo and the Transhumanist Declaration—are introduced and critically analyzed. Fourth, the essay concludes what Burke can tell us about transhumanism’s rhetoric on nature, technology, and man and what transhumanism can tell us about Burke’s attitudes toward humans. Throughout the essay, to enrich the dialectic with a perspective by incongruity (Burke, Permanence 89), I contrast transhumanism with its alternative—ecological holism. When juxtaposed with ecological holism, transhumanism appears to be a rhetorically sophisticated instantiation of a reductionist materialist ideology: Instead of a living whole, it offers a mechanically enhanced biological part. Aligning itself with a Cartesian conception of the body, it forsakes the very organicism with which it seeks to unite. According to Burke, terministic screens are language uses that filter human perception (LSA 45). All symbol systems employ terministic screens in the building of an ideology. As language is the primary resource used in constructing an ideology, terministic screens are an unavoidable part of any ontology, epistemology, or axiology. Therefore, coming to terms with the language uses that occur and recur in the construction, maintenance, contestation, subversion, and transformation of a symbol system that takes itself seriously is a serious undertaking. In The New Rhetoric, Perelman and Olbrechts-Tyteca present several philosophical pairs with important rhetorical uses. These are: (1) appearance/reality; (2) one/many; and (3) being/nonbeing (423). Examining any major philosophical pair as it manifests in a particular discourse through Burkean rhetorical criticism enables an understanding of the predisposed symbolic action suspended in that particular discourse. As Voigt attests, in the life sciences the holism-reductionism dialectic figures prominently. As an ideology transhumanism normalizes and advocates for a fundamentally altered natural order. As such, what it signifies can be better understood by exploring its latitude of acceptance or rejection of holism and reductionism. As the “universal invariant,” dialectic is both a structural framework and potentially transformative linguistic agent. This is true for the philosophical pair of being and non-being, as well as what Burke calls the fundamental rhetorical situation—segregation and congregation. How humans self identify themselves in this world has profound implications for the rest of this world. The non-humans in this world, including plants, non-human animals, and elements of earth, air, fire, and water are all affected by the ways humans segregate and congregate. How humans use rhetoric to create segregations and congregations of meaning will have consequences for being and non-being, also. Justifications for what gets to exist, in what way, where, how, and why, will be generated from the rhetorical resources of differing congregations and segregations of meaning. This rhetorical situation gives humankind incredible power to manipulate justifications for evaluations over being and non-being. Indeed, as Burke knew, we are both the symbol using and misusing animal. The relationship between the whole and the parts of any system is a good indicator of a particular rhetorical discourse’s social consequences. Prevalent ecological attitudes toward invasive species are a good example of this. Ecosystems are communities of different species cohabitating. A holistic view of healthy ecosystem management requires from time to time the deliberate eradication of an individual member of a group that “does not belong”—an invasive species. Such a tactic prioritizes the whole over the part in order to maintain a semblance of equilibrium for the other pre-existing individual members of the ecosystem. A reductionist view, however, may question the legitimacy of privileging the whole over the parts, or even a particular part of a larger whole. The holism-reductionism dialectic is a useful analytical framework for a Burkean interrogation of transhumanism’s terministic screens precisely because as rhetorical discourse, transhumanism thought will necessarily create congregations and segregations of meaning. Moreover, because transhumanism brings into question the very essence of human self-identity, its rhetorical situation uniquely affects not only humans, but the rest of the non-human world as well. In the spirit of Burke’s critical, rhetorical approach to dialectic, I coin the use of the ± symbol with the holism ± reductionism philosophical pair to apprehend transhumanism’s attitude toward holism and reductionism. It allows for an elegant Burkean articulation of how terministic screens goad audiences to develop an attitude of acceptance (+) of one pole of a dialectic while developing an attitude of rejection (-) toward the other. As Frank and Balduc indicated, these rhetorically-charged attitudes can create value hierarchies and through the negotiation of these attitudinal tensions, new social realities are constructed and legitimized (60). Transhumanists envision virtually endless new social realities: portable holographic message devices transmitted and activated through biochemical control triggers; simulated simulations; boundaryless biomechanical technological advancements; nonmammalian machine men, abstracted information centers with diagrammed tele-nodes to connect with for a reasonable user-fee, memory downloading and identity uploading, etc. Rhetoric has always concerned itself with the probable contingent human social realities caused through intermediated symbolic agency. While “the possible” is a fertile space for imagination and rhetorical inventio, freewheeling symbolic action will always be interfered with at some point by a rhetor with some…or other bias or vested interest. In other words, while some aspects of tranhumanists’ vision for what is possible and desirable may be uncontroversial or beneficial, other elements of this “far-out rhetoric” (Frank 7) will likely meet resistance and become targets for rhetorical disputation on ethical, political, cultural, religious, economic, and medical grounds. Now that the theoretical framework has been explained and synthesized, the essay uses this framework to examine two landmark transhumanism texts: J. D. Bernal’s essay “The World, The Flesh, and The Devil” (1929) and Julian Huxley’s “Transhumanism” (1953). These particular texts have been selected to analyze transhumanist rhetoric due to their central role in the ideological figuration of the contemporary transhumanist movement. Bernal was the first reputed respondent to J. B. S. Haldane’s groundbreaking 1923 essay Daedalus: Science and the Future and is one of the contemporary transhumanist movement’s progenitors. Huxley is purported to have been the first rhetor to have used the word “transhumanism” in his public discourse (Bostrom 2005). Transhumanist discourse enjoins a scientistic use of language. Early transhumanist discourse was influenced by twentieth-century scientists to “translate the problems of action into terms of motion” (Burke, Grammar 239). Perhaps this is not so surprising. This reduction of action to motion was one of Burke’s chief complaints with General Semantics—the field which influenced cybernetics, which has in turn been one of the most influential predecessors of the field of Artificial Intelligence (AI), a version of action-motion convergence that transhumanism has embraced. In other words, as Burke so ingeniously observed about how language functions as a terministic screen, “crede, ut intelligas,” or “Believe, that you may understand.” Burke provides us with the analytical ability to read into this passage the sine qua non of language as attitudinal and hortatory. In this passage, one of transhumanism’s early proponents prepares the way for future audiences to believe in certain implications of man’s advanced evolutionary status. There is also a strain of pre-determination in this passage. Whether he wants or realizes it, man has an “inescapable destiny." In this early transhumanist rhetoric, the predictive agency of science combines with a definition of man that itself uses symbolic action to advance an idealization of motion. To elaborate on these features of transhumanism language use, and to provide further insight into transhumanism’s terministic screens, transhumanist rhetorics of materiality and body will now be addressed. Key words in transhumanism texts such as “mechanical,” imitate,” “construction,” and “possibility” bind together in the discourse and provide a better understanding of the metaphysics of the transhumanism ideology. Not only does the nature of our terms affect the nature of our observations, in the sense that the terms direct the attention to one field rather than to another. Also, many of the “observations” are but implications of the particular terminology in terms of which the observations are made. In brief, much that we take as observations about “reality” may be but the spinning out of possibilities implicit in our particular choice of terms (Language as Symbolic Action 46). Bernal’s notion of the cosmos, the “physical world” in his sub-essay “The World” is a stage where transhumans can rearrange the set at will and where the “macro-mechanical” (Bernal’s term for outer space) and the “micro-mechanical” (Bernal’s term for the subatomic molecular biological world) should be manipulated by imitating nature’s script—its “mechanism of evolution” in order to construct a new existence where our species can improve upon nature and defeat our “opponent”—space-time curvature and entropy. Bernal’s rhetorical move of abstracting information from the physical forms of biological organisms and planetary or cosmic systems is one of many disconcerting features of transhumanism discourse (Brooke, 788). It is also interesting to note that in his exposition on “reality,” Bernal feminizes nature and adopts an antagonistic attitude toward biological, spatial, and temporal constraints on the human condition of mortality. Thus, it is interesting to note that in 2015—as Frank observed—there are three times as many men as women—at transhumanism gatherings. This rhetoric seems to exude a paternalistic and even misogynistic attitude toward nature, which is feminine. Furthermore, in Bernal’s rhetoric, due to the plastic nature of our mechanistic, materialistic physical reality (motion) and the antagonistic attitudes toward nature inherent in the essay, the terministic screen of “construction” yields the possibility of a newly built hierarchy complete with mechanical angels, transhumanism space colonies, and human zoos; It is almost as if this early transhumanism ideologue is rewriting Dante’s vision of the universe, with a set of decidedly different language filters. Out of this scientistic, antagonistic, and paternalistic materialism, derives the transhumanism corollary of the human body, which is devalued. An interesting perspective by incongruity can be offered here by the rhetoric of ecological holism. Because ecology is a subfield of biology, ontologically speaking, corporeality is construed as living matter. Furthermore, in ecological holism, parts of a system are biological parts that are functionally integrated into mutually necessary relationships. It is precisely because ecological holism does not abstract information from biological bodies that the distinction between nature and culture is unwarranted. In ecological holism, information is embodied and distributed in functional networks constrained by ecological principles such as predation, population balance, and succession. In ecological holism, corporeal bodies are “bio” logical, embedded in, and constitutive of food chains. For this very reason organicism is vital to ecological holism. Bodies are for consuming and being consumed, not plastic material containers for a directing and extractable intelligence. Thus, one of the key terms of ecology—decomposition—provides a striking antilogy when compared with key terms constituting transhumanism’s terministic screens. Because the terministic screen of ecological holism begins with biological premises, bodies of living things decompose. This process means the bodies of individual life form parts of the living system and eventually become food for other members of the system. As Hawhee has extensively argued, bodies are rhetorical. In Burke’s definition of man, the body is where action and motion meet. The body in transhumanism discourse, is degraded. This implication, as many deep ecologists and eco-feminists have noted, is already present in Descartes’ cogito ergo sum (Plant 1989). In transhumanist rhetoric, because of its essentialist materialist assumptions, the body becomes the site for a problematic tension between teleological mechanism and human identity. Because the body is the nexus between symbolic action and non-symbolic motion (Burke, “(Nonsumbolic Motion)”814) transhumanism’s terministic screen spins out its rhetorical resources in a reconceptualization of the body, including the brain. In his sub-essay, “The Flesh,” Bernal posits: “man himself must actively interfere in his own making and interfere in a highly unnatural manner”. It is here, with regard to the human body, that Bernal advances and perhaps “perfects” the reductive nature of transhumanism’s teleological materialism. In contrast, Burke understood the entelechial motivation of man as contributing to man’s rottenness. Man, for Burke, is “rotten with perfection.” It is the very symbol use and misuse that goads man on to perfect his vision of the world without recognizing that he is endeavoring to actualize the implications inherent in his own terminology. This is exactly the insight that brings Burke to declare that man is, “rotten with perfection.” It is when Bernal’s and Burke’s definition and conceptualization of man’s relationship to his body are juxtaposed that we see dramatic differences between transhumanist rhetoric and Burke. According to Bernal, the invasive procedure of surgery has taken humans further along the evolutionary journey. The improvement of “primitive nature” in adapting stones, clothes, spectacles, and artificial languages are indicative signs of this technological progress. However, it is with surgery that humans need to “copy” and “short-circuit” evolution by altering the germ plasm to break off from organic evolution, manufacture life, transform human beings, and build a “mentally-directed mechanism”. The primacy of mind over matter is revealed in what Bernal believes is a mere difference of degree of the “mechanism of evolution” rather than a difference of type. Never mind that the body has now become a kind of mechanical canister containing a compound mind. According to Bernal, this “mechanical man” will “conserve none of the substance and all of the spirit” of our species’ previous selfhood. It is at this very place in the discourse where Burke would warn of the problematic overlay of the terminology of motion onto the symbolic world of action. The body has been reduced to a sheer canister (i.e., “substance”) exactly because transhumanism’s terministic screen has abstracted mind (i.e., “spirit”) to such a stellar degree that the converse pole of the dialectic—body—has been devalued so that corporeal reality could mean anything, even a plastic sheath. Early transhumanist rhetoric is not just authorizing plastic surgery but rather a complete manipulation of the human body to an unrecognizable form. Another way to think about this is that because of transhumanism’s prioritization of the abstracted mind the material body gets left behind or undeveloped. This is a lopsided dialectic where the mind is equated with action and the body with motion. This suggests that transhumanism is a complex version of a reductionistic materialism. The implications for the material body as seen through transhumanism’s terministic screens are perplexing. Moving closer to machinery and further away from biology has many nuances. The intangibility of mind/spirit and the corporeality of the body has had humans wavering between animals and machines in classical and contemporary literature and philosophy. In classical Greek theater, God was introduced to a scene with humans brought onto stage suspended in air with the help of a mechanical crane-like device (Deus ex machine). Descartes introduced his famous mind/body dualism in the 1600s. More recent 20th twentieth-century accounts are found in examples such as Oxford philosopher Gilbert Ryle’s “Ghost in the Machine” and John Durham Peters contemporary account of the history of communication. These investigations span thousands of years of this most human preoccupation. In the transhumanism view, spirit and substance are posited as inherent binaries. Thus, fundamentally altering the body—including the brain—is acceptable because the “spirit” of humanity will continue in a vastly transformed if unrecognizable package. The continuity in this material transformation of the human would result from immensely more complex physical configurations enabling redistribution of energy and information, but perhaps not memory. Mind controls and directs the information, thus body becomes a plastic vehicle necessary to house the infinitely greater potentiality of mind, which has been compounded with information added from other abstracted individual minds. The human body seen through this terministic screen is essentially a vessel for compounding and re-distributing information. By many current social norms organ transplants could give way to organ harvesting; substitution of living parts (e.g., organs) to extend the life of the whole (e.g., organism) is a comparatively accepted practice. However, mind uploading, eugenics, bio-ports, and nanotechnological implants—by and large commended by transhumanists—is another matter. It is in this way that transhumanist rhetoric differs significantly from contemporary dominant biomedical ethics and functions as a mechanically-oriented mythology of the future. Transhumanism privileges a scientistic and technologically-rendered redefinition of what humans are meant to be: “Believe, that you may understand.” Transhumanists imagine that these further technological developments are consistent with “actively interfering with our own making” which we have been doing since we started making stone tools and using fire. In other words, they see even these fundamental alterations to the human being as differences in degree rather than differences in kind. The real difference however, can be seen in terms of the transformed identity and experience of transhumanist reality. These issues can be examined through transhumanism’s role for human beings—their agency and responsibility. For it is here in the mode of roles, Burke contends, where symbolic action shapes the Self. It should be clear at this point in the analysis that transhumanism has strong tendencies for a kind of teleological mechanism and a species-centric frame. What needs to be understood and emphasized, however, is just how strong these ideological tendencies are in terms of the role and moral imperative of homo sapiens in transhumanism discourse. Key words such as “man,” “colony,” and “control” indicate a metanarrative of axiological claims with troubling sociopolitical and socioeconomic implications. If you think it through, actually, when a zebra is being eaten alive by a lion, that’s one of the worst experiences that you could possibly have. And if we are compassionate toward our pets and our kids, and we see a squirrel suffering in our backyard and we try to help it, why wouldn’t we actually want to help the zebra?” We could genetically engineer lions into herbivores, he suggested, or drone-drop in-vitro meat whenever artificial intelligence detects a carnivore’s hunger, or reengineer “ecosystems from the ground up, so that all the evolutionarily stable equilibriums that happen within an ecosystem are actually things that we consider ethical.” (Frank 6). The principle of perfection (the ‘entelechial’ principle) figures in other notable ways as regards the genius of symbolism. A given terminology contains various implications, and there is a corresponding ‘perfectionist’ tendency for men to attempt carrying out those implications (Burke 1966, p. 19). The essay now examines two key elements to the contemporary rhetoric of transhumanism: The transhumanist logo and “The Transhumanist Declaration”. These rhetorics are essential to constructing the dominant symbolic identity of the contemporary transhumanist ethos. Logos have become an immensely potent force in contemporary culture, and are no longer the exclusive purview of corporate brands. They are equally central to social marketing campaigns and social movements of all types. According to Naomi Klein (1999), a logo is now “the central force of everything it touches” (29). In addition to the power of logos, declarations have long been used as political and legal statements of identity and value. In combination, the transhumanist logo and Transhumanist Declaration provide a synthesized “identity platform” including both visual and textual elements to analyze. The transhumanist logo (see Figure 1) is the codified identity of the transhumanist movement and is featured by prominent organizations belonging to the movement such as Humanity+, Inc. and the Transhumanist Party. The transhumanist logo betrays an attitude of acceptance toward reductionism, or what this analysis calls a “Reductionist+” leaning. The primary contention regarding the transhumanist logo pertains to the misconceived or misrepresented nature of the dialectic of substance, or identity. The transhumanist logo is incomplete or partial, in a way. As we have seen, transhumanist rhetoric claims that its ideology values relationality rather than strict and narrow identity for human beings. The transhumanist logo, however, freezes a symbolic representation of identity that is rhetorically biased. The “h” stands for human or humanity. In addition to this, the logo adds a plus sign to suggest that transhumans are “more than” human. In fact, this positive integer is only a fraction, and a misleading one at that. The inherent significance of transhuman is that humans’ existence is obtained as a condition of permanent incompleteness and constant re-location or re-lationship. Harold (2000) identifies this quality of the posthuman condition when she states that bodies “are continually mutating through its relationship” (884) with outside forces such as food and technologies. The fact that the transhumanist logo symbolizes incompleteness is not inherently problematic. The problem is that with transhumanist’s logois that this intermediacy or indeterminacy is given an overt “+” sign and a correlating implicit attitude of acceptance. There is a subtle conflation of symbolism such that the plus sign (“+”) in the transhumanist logo means both “more than” and “positive”. Why is there not a minus sign in the logo also representative of what humans would be losing, subtracting, or giving up in their acceptance of being more than human? From a Burkean perspective, this is a perfect revelation of the fundamental rhetorical situation. Transhumanism advocates have assembled as a group of human rhetors to rearticulate the meaning of the human condition. In the unfolding dialectic of their rhetoric, they have convinced themselves that the rhetorical vision they have articulated together is not only fundamentally accurate metaphysically or scientifically but fundamentally positive in terms of axiology. If transhumanism were a neutral or objective scientific rhetoric of the dialectic of substance, the logo would require the missing minus sign. Over time, the ambiguity of this meaning system would fade and future audiences would then be left with a polished meaning system belying the bias and vested interest of the meaning-makers themselves. In other words, while advocates of the posthuman condition may reasonably propose that humans are and always have been indeterminate, it is clear from the transhumanist logo that what is very determined is the positive bias toward whatever post-human entity is arrived at through whichever technological mutation is desired or sanctioned by transhumanist ideology. What is more, the Transhumanist Party, founded in 2014, has encoded the transhumanist logo into a flag (see Figure 2) that is an alteration of the official flag of the United States of America. Flags, of course, are an important rhetorical staple in the legitimization of an imagined community (Billig 45-46). Decoding the Transhumanist Party flag is not difficult. In place of the stars that symbolize the 50 states that make up the United States of America, the transhumanist movement has substituted their logo. Apparently, instead of the political imaginary of 50 “states” united, under a Transhumanist Party ideology we would have a country united by various species of transhumanist beings. In addition to recently forming the Transhumanist Party as a non-profit organization, in 2015 the Party presented a Tranhumanist Bill of Rights to Washington and announced a 2016 US presidential candidate. In 2017, Peter Thiel—a prominent transhumanism advocate is a powerful presidential advisor for Donald Trump. We advocate the well-being of all sentience, including humans, non-human animals, and any future artificial intellects, modified life forms, or other intelligences to which technological and scientific advance may give rise. We favour allowing individuals wide personal choice over how they enable their lives. This includes use of techniques that may be developed to assist memory, concentration, and mental energy; life extension therapies; reproductive choice technologies; cryonics procedures; and many other possible human modification and enhancement technologies. Both sets of declarations disdain biological determinism, adopt the master rhetorical frame of rights1 (Benford 1), advise rational discussion and debate on the integration of humans and technology, proclaim the well-being of all sentience, and are hopeful for “enhanced” human conditions but adversarial about technological bans/prohibitions. A few significant differences between the two declarations deserve to be mentioned. The Humanity+ declaration calls for heavy investment in this research agenda and uses an appeal to urgency. The master rhetorical frame of rights is also used differently by the two different transhumanist organizations. Humanity+ uses the more accepted language of “individual rights”. The World Transhumanist Association uses a much more aggressive stance with the language of “moral right”. The World Transhumanist Association claims that transhumanism encompasses many principles of modern humanism and also that transhumanism does not support any particular political party, politician, or platform. There are many noteworthy rhetorical maneuvers in these declarations, including the use of the rights master frame, appeals to urgency, association with generally agreed upon values, euphemisms, appeals to rationality, negative and positive rhetorical visions of the future, opposition and advocacy of different versions of determinism, and objectivist rhetoric. While fuller elaboration of these rhetorical moves is outside the scope of this chapter, they are significant rhetorical aspects to the Transhumanist Declaration. The most important feature of these declarations for the thesis advanced in this essay is the recurrence of the focus on individuals. This lends further support for the claim that the transhumanist is a rhetorically sophisticated instantiation of a reductionist ideology: instead of a living whole, it offers a mechanically enhanced biological part. What is remarkable is the fact that this reductionism happens on two levels: the individual human being in relation to his/her environment as part of an ecosystem and the human organism in relation to his/her own biological organs and biochemical electrical systems. Whether the language invoked is “individual rights,” “personal growth,” “personal choice,” “human potential,” “modified human,” or “enhanced human conditions,” there is a thoroughgoing reductionism which privileges the (trans)human over another human or all (trans)humans over everything else. This reductionism leads to a problematic hierarchy. Burke (1950) reminds us that hierarchy, “with its original meaning of ‘priest-rule’” (306) can also be found in “the Darwinian doctrine of natural evolution” (137). But when the principle of hierarchy is reduced to purely material gradations of “higher” and “lower,” we “are then in the state of the ‘fall,’ the communicative disorder that goes with the building of the technological Tower of Babel” (139). Ecological holism and even evolutionary biology on the other hand, recognize mutuality between human beings, other life forms, and the nested energy between individual organisms and their ecosystems. At a very basic level, the fact that the human body is teeming with millions of bacteria and outnumbers human cells at a ratio of 10:1, reflects this mutuality (Mara & Hawk, 2010, 2). Furthermore, ecological holism does not attempt to understand life forms in isolation. Not only do transhumanism’s terministic screens isolate human beings, they associate the human species more closely with machines and actively disassociates them from nonhuman animals and terrestrial flora. The omission of terrestrial flora and inanimate elements should be noted also; Man-made machines are given priority over naturally occurring non-animal biological or elemental forms of life. Some scholarly accounts go as far as claiming that transhumanism has no concern for other living beings (Welsch 3). Prioritizing wholes rather than parts, rejecting reductionism, and eschewing oversimplification, ecological holism employs terms such as community, association, emergence, organicism, integration, niche, diversity, symbiosis, and web. Because ecological holism’s attitude that the whole is a community of organisms that create a “superorganism” (Voigt), individual species (and members of species), agency is constrained by the living system’s needs and responsibility manifests as playing one’s part in the community, analogous to an organ’s functioning for an organism. The terministic screens of ecological holism are socialized in a manner that transhumanism cannot be. While individual interactions constitute the whole, a living system (i.e., association, community, ecosystem) cannot be fully understood by reducing it to the sum total of its interspecific relationships. This analysis of transhumanism’s terministic screens has fleshed out many of the filters this discourse has employed through the rhetorical resources of its key texts and contemporary symbols. In particular, this analysis brought into focus its positive bias toward “humanity+”; The Transhumanist Declaration’s reductive focus on the part rather than the whole at numerous levels; problematic hierarchy; a materialistic view of the physical universe; a degrading attitude toward the human body and a paternalistic attitude toward nature; teleological mechanism; a utopian myth of technological progress; and a category mistake between causality and intentionality. If rhetoric emerges from dialectic, then the hope is that this critical analysis has provided some illumination of the assumptions, implications, and probable consequences of transhumanism’s terministic screens. The terminological screens through which transhumanists spin out the resources of their rhetoric include mechanism, imitation, possibility, colony, man, sentience, control, and construction. These screens filter some meanings and values in and other meanings and values out. Included in the in-filtering are ideologies of micro and macro mechanism, reductionism, technotopia, transcolonialism, neoanthropocentrism, material hierarchy, and a scientistic predetermination of man’s agency to transcend itself. The out-filtering contains many other versions of posthumanism, postcolonialism, classical humanism, evolutionary biology, ecological holism, egalitarianism, and normative biomedical ethics. The word “transhumanism” has been selected to function as the title of this brave new movement. As any terminology “must implicitly or explicitly embody choices between the principle of continuity and the principle of discontinuity” (Language, 50) which do transhumanists choose? Does the “trans” or the “human” control the direction for the transhumanist’s rhetorically imagined future? If the “trans” wins, the principle of discontinuity for the species prevails; If the “human” wins, the principle of continuity for the species succeeds. Most terminologies do not conjoin the dialectical ambiguities of language into a unified whole. The new relationality transhumanists posit between man and nature with technology as the boundless mediator reflects this entitlement. This is both the genius of transhumanism as well as its associated risk. In this analysis, the conclusion is that transhumanism privileges discontinuity for the species’ public memory and inherited identity of what it means to remember and to be human. In a way, the discontinuity between humans and the rest of nature stressed by other scientific (Darwinian evolution), metaphysical (Dante), and theological (Judeo-Christianity) hierarchies aligns transhumanists with a transcendent attitude of man’s “true nature.” On the other hand, transhumanists do declare an alliance with and respect for all sentient life. Most importantly, unlike ecological holists, transhumanists’ sense of continuity comes at the cost of a significant reductionism. This unique brand of reductionism would replace a biological whole for a mechanical part, not deducing a difference in kind that would result and consequently devalue other “non-mutated” biological forms in the elaborate web of life of which the human participates. One of the key insights of juxtaposing transhumanist rhetoric with Burke’s rhetorical theory is Burke’s humbling of humans. Rather than elevating man above the rest of the natural world, Burke recognizes both continuities and discontinuities between the human species and other life forms. Burke realized that not only are we caught up in webs of signification that we ourselves have spun, but that the urge and compulsion of humans to perfect their terminologies and thereby themselves does not lead to transcendence. We are animals, but so too are we separated from “our natural condition by tools of our own making” (Burke, 1966, Language 13). In attempting to perfect its own terminology—and our species in the process—transhumanism’s terministic screens lead instead to a privileging of mere motion and machinery, and would substitute the authentic human spirit for mastery of an eternity of motion. It is the perfecting of transhumanism’s terministic screens through symbolic action that allow this possibility. Transhumanist rhetoric advocates for a type of transcendence for our species that some of us may be goaded by. But while we are goaded by this spirit of hierarchy, rather than collective elevation or sustainability through ecological holism, Transhumanist rhetoric spins out a strong materialist reductionism, substituting a mechanical part for an organic whole. Burke realized that “substitution sets the condition for ‘transcendence’” (LSA 8). But for him, this should not be seen by our species as an invitation to self-flattery, but rather admonition. 1. The concept of a “master frame” has been used by social scientists to explain the success of certain political discourse occurring within social movements. Basically, a master frame such as “rights” is appropriated by a movement and applied to its own domain of discourse. For example, “civil rights,” “animal rights,” “women’s rights,” “indigenous rights,” etc. The fact that the Transhumanist Party has developed a Bill of Rights in the last year indicates this is a rhetorical strategy of the movement. For a more lengthy explanation of the concept of master frame, see Robert D. Benford’s 2013 entry in the Wiley Blackwell Encyclopedia of Social & Political Movements. Abram, David. The Spell of the Sensuous. New York: Pantheon, 1996. Bernal, John. Desmond. The World, The Flesh, and The Devil. 1929. Web. 15 March. 2015. Billig, Michael. Banal Nationalism. Los Angelos: Sage, 1995. Bostrom, Nick. "A History of Transhumanist Thought." Journal of Evolution and Technology, 14 (2005): 1-25. Braidotti, Rosi. The Posthuman. Malden, MA: Polity Press, 2013. Crable, Bryan. ""Symbolizing Motion: Burke's Dialectic and Rhetoric of the Body." Rhetoric Review 22 (2003): 121-37. Frank, Sam. “Come With Us If You Want To Live.” Harper’s (January 2015). Frank, David A., and Michelle K. Bolduc. “Lucie Olbrechts-Tyteca’s New Rhetoric.” The Promise of Reason: Studies in the New Rhetoric. Ed. J. T. Gage. Carbondale: Southern Illinois UP, 2011, 55-80. Harold, Christine L. "The Rhetorical Function of the Abject Body: Transgressive Corporealityi n “Trainspotting.“ JAC: A Journal of Rhetoric, Culture, & Politics 20.4 (2000): 865–87. Hart, Rod. “The Rhetoric of the True Believer.” Speech Monograph, 38.4 (1971): 249-61. Hawhee, Debra, and C. Holding. "“Case Studies in Material Rhetoric: Joseph Priestley and Gilbert Austin.” Rhetorica 28.3 (2010): 261-89. Hawhee, Debra. Moving Bodies: Kenneth Burke at the Edges of Language. Columbia: U of South Carolina P, 2009. —. "“Review Essay: Somatography.” Quarterly Journal of Speech 93.3 (2007): 365–74. —. "“Rhetoric, Bodies, and Everyday Life.” Rhetoric Society Quarterly ˆ (2006): 155-64. —. Bodily Arts: Rhetoric and Athletics in Ancient Greece. Austin: U of Texas P, 2004. —. "“Bodily Pedagogies: Rhetoric, Athletics, and the Sophists’ Three Rs.” College English 65.2 (2002): 142-62. —. "“Emergent Flesh: Phusiopoesis and Arts of Training.” Journal of Sport and Social Issues 25.2 (2001): 141–57. Huxley, Julian. “Transhumanism.”New Bottles for Old Wine. New York: Harper and Row, 1957. Klein, Naomi. No Logo. New York: St. Martin’s P, 1999. Kosoff, Maya. “Donald Trump Has Made Peter Thiel Immensely Powerful.” Vanity Fair (February 27, 2017). Mara, Andrew, and Byron Hawk. "Posthuman Rhetorics and Technical Communication.” Technical Communication Quarterly 19.1 (2010): 1-10. Muckelbauer, John, and Debra Hawhee. "“Posthumanist Rhetorics: ‘It’s the Future, Pikul.’” JAC: A Journal of Rhetoric, Culture, & Politics 20.4 (2000): 767–74. Perelman, Chaim, and Lucie Olbrechts-Tyteca. The New Rhetoric: A Treatise on Argumentation. Indiana: U of Notre Dame P, 1969. Durham Peters, John. Speaking into the Air: A History of the Idea of Communication. Chicago: U of Chicago P, 1999. Plant, Judith. Healing the Wounds: The Promise of Ecofeminism. New Society Publishers, 1989. Plato’s Phaedrus. Trans. R. Hackforth. Cambridge: Cambridge UP, 1952. Ryle, Gilbert. The Concept of Mind. Chicago: U of Chicago P, 1949. Welsch, Wolfgang. "Mapping Trans- and Posthumanism as Fields of Discourses." Seoul, Ewha Womans University: Keynote presentation at the International Conference 2014. Web. 4 May. 2016. Zappen, James P. “Kenneth Burke on Dialectical Rhetorical Transcendence.” Philosophy & Rhetoric 42 (2009): 279-301.